Calorie Fluor exhibited on ASH EXPO 2016. More than 2,000 exhibitors and attracting crowds of 60,000 industry professionals from every state in America and 150 countries worldwide. It provides a unique forum designed expressly for the HVACR community, allowing professionals to get together to share new products, technologies, and ideas. 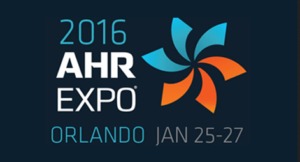 The AHR Expo is co-sponsored by ASHRAE and AHRI, and is held concurrently with ASHRAE’s Winter Conference.